Hello. This is a Korean in America. 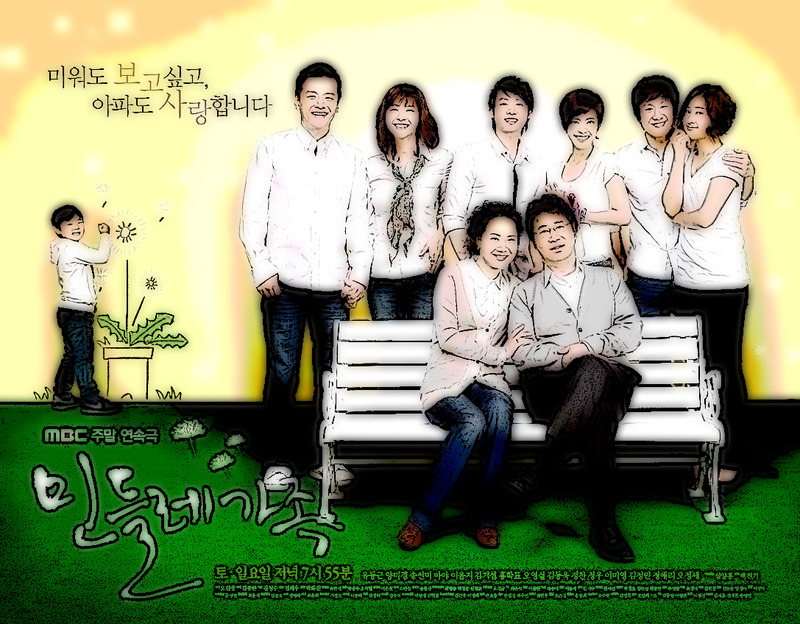 In this article, I would like to discuss the long running Korean family drama genre. It is a subgenre of K-dramas in which interesting characters, dynamic relationships, and slice of life storytelling need to come together but usually falls short. While there are many difference sub-genres in recent Korean dramas, there are three major categories of Korean dramas. The first is the miniseries which airs about 16 to 20 episodes. The second is the daily series that run every day. A similar example would be the daily soaps in the U.S. The third is the 50 + episode long running Korean dramas. This category tends to include many so called historical epics but are mostly composed of family dramas. I will be talking about mainly the family dramas as the historical epics are a rather different beast. This includes relatively recent series such as “I Summon You Gold”,”You’re The Best Lee Soon-Shin”, and “Assorted Gems”. In the world of K-dramas, a miniseries runs for about 16-25 episodes while a long running series runs about 50 episodes and commonly exceed that. Thus, a long running show (Full Series) is comparable to about 2 seasons of a normal U.S. network series. This means that these shows require a significant time investment to enjoy them. If you have ever browsed through a list of Korean dramas to find something to see, you would have had the experience of skipping over a Full Series in favor of the miniseries format. At the time, time was not the only reason for hesitation. Long running Korean dramas have developed a poor reputation over the last half decade or so. This format tends to be viewed as being directionless and a lacking in ultimate payoff on part of the viewer. And, to be frank, this reputation is well earned. What are long running family dramas? As the name implies, the family dramas are usually about the stories of groups of characters who are usually structured into family units. While the shows have a main plot, the shows are mostly structured around an assortment of multi-episode subplots with the main plot loosely tying together these disparate subplots. These subplots are usually motivated by the inner-family dynamics. At the same time, the modern family dramas are not truly slice of life shows. If you look back at the family dramas before the 90s, those shows were true slice of life shows. The modern family dramas are an evolved form of the past shows by actually incorporating an overall plot to the format. Think about what happened to U.S. television during the 90s. There was a transition between a purely episodic form of storytelling, that could run until people got sick of it, to a more serialize form of storytelling that had a focus and an actual ending. The evolution of the long running family drama could be seen as a similar phenomenon to this. The problem with this evolution is that, at a structural level, the serialize type of storytelling is rather difficult to sustain over long periods since it does incorporate an ending. There is a limit to which a single story could be stretched even in combination with various subplots. While time for the characters on screen may flow slowly for the characters on screen, time flows at a consistent pace for the show’s audience who are watching. To a degree the inclusion of various subplots does help. However the subplots in Korean dramas do not have enough variability in their stories and they tend to be haphazardly constructed. One of the reasons why the episodic storytelling format dominated the TV over the past few decades is that you did not have this issue since you could fit a short story into one episode. This made it easier to write and film a show on the go since most shows only have a lead time of a few weeks at best to come up the script and film an episode. For a serialize show, this becomes more difficult as each episode needs to fit into the overall plot which is never really properly thought out of beforehand. You just make it up as you go. This is worse for long running Korean dramas. In regard to the main plots of long running Korean dramas, a significant degree of variability and flexibly built into the original concept is required in order for them to be sustainable. The current Korean drama industry simply cannot provide this. Because of the homogenous nature of Korean society and the characteristics of the Korean entertainment industry, the stories of Korean dramas are insular and rather figuratively incestuous. In other words, the sources of variability in Korean dramas are few in between. Let’s just talk about the logistics of making a show. A Korean drama only uses a set of characters and that is it basically. In a way, it is not dissimilar to a theatre company. There are barely any uses of guest actors in the manner in which the U.S. audience have become accustomed to. So, it is unavoidable that the scope of the show is narrow as you cannot bring in other actors to spice up the stories. Thus, it is difficult to build in enough variability and flexibly into the original concept. Long running family Korea dramas try to compensate by having various wacky or troublemaker family members and giving them subplots. The issue is that they are simply not that many types of stories used by Korean dramas. How many stories could you create when nothing about the characters’ hobbies and other personal interests are mentions? Furthermore, since this is a family drama, eventually, every subplot has to be tied to the family or the larger society. In addition, the conclusions to these subplots have to reinforce the society’s view on families. In other words, no matter how it starts, it has to end in an afterschool special. So, the best we could expect is that a family drama has a compelling main plot that is reasonably spread over the 6 month or so air time and has a decent number of interesting side family characters one can attached “not” so boring subplots to. The issue is that it is not common for even half of the subplots to be interesting enough to warrant the air time assigned to them. This creates major disruptions to the pacing of the main plot which may not have enough meat to it for the 50 or so episode run anyway. I have never actually seen a main plot for a family drama that could sustain 50 plus episodes. The maximum was 30ish episodes. There are only two manners in which these disruptions could be handled. One is to abruptly end the subplots and create new ones haphazardly. The audience calls these subplots “fillers”. A serialized method of storytelling is not a good place for trying out unproven story lines. That is more for an episodic storytelling method. In addition, this puts the main plot on hold until the final stretch of the series’ run. As a result, it loses steam. Another is to focus on the main plot but then ending up concluding it before the show’s run had ended. So, what was going to be a subplot then is converted to the main plot. This has its own issues. This latter half also feels like “Filler” since it has nothing to do with the main plot prior to it. With the current structure of long running family dramas, I do not know whether a solution exists. The time commitment alone makes the viewing difficult to viewers. The lack of sustainably makes it worse. Over the last decade, there are only a few long running family dramas I have finished. And, if I were to watch them in real time, I am not sure I would have even done that. The best for a long running family drama would be to start off with several interesting core characters that could establish interesting relationships in addition to working well off each other. They should have diverse social background to use as story backdrops. Then, cross one’s fingers and wish for the best. In the age, when even a 16 episodes miniseries has difficulties in maintaining its momentum and plot pacing, what chance does a 50 episode family drama have? If you enjoyed this article, please push the donate button to donate $1 which would help maintain this blog. Thank you. Thanks for another lesson. :) I agree about the family dramas. I have yet to actually finish one. I was watching Smile, you, and while it's good, I still dropped it for a while with about 15 episodes to go. And it's only 45 eps. The only other one I want to watch is Ojakjyo Brothers because it has actors I really like and don't mind watching for 50 eps. But I tend to stick to the 16-24 format. I'm still struggling to get through Jumong since it's dragging around ep. 30.
its the 30 episodes hump!